Please visit Alyeska’s employment page at http://www.alyeska-pipe.com/Employment/JobOpportunities and click on the job number to review a full job description. Please follow the instructions on how to apply with Alyeska. Alyeska offers competitive salaries and a comprehensive benefits plan. They are also an Equal Opportunity Employer that values Workplace Diversity. The Doyon Foundation Office will be closed Wednesday June 13 from 1:30 to 5pm and all day Thursday & Friday, June 14-15. We will be at our biggest fundraiser, the 12th Annual Morris Thompson Memorial Golf Classic. We will reopen Monday June 18th at 8am. Thank you! Register by Friday for the Golf Classic! Have you registered for the 2012 Morris Thompson Memorial Golf Classic? The payment and registration deadline is this Friday, June 8! Register quickly, easily and securely online. The golf classic takes place Thursday and Friday, June 14 and 15 at the Chena Bend Golf Course on Fort Wainwright in Fairbanks, Alaska. The event benefits our Morris Thompson Scholarship Fund, an endowed fund that provides scholarships to hard-working Alaska Native students. For more information on the golf classic, visit our website or view our brochure. You can also contact us at 907.459.2048 or foundation@doyon.com. Hope to see you on the greens! Alaska Process Industry Careers Consortium is currently seeking a qualified person to take on an important role. The right candidate would possess a unique set of skills and qualifications to effectively fill the role Engineering Academies Coordinator, and the Job Description is attached for reference. cketterling * www.apicc.org with any questions, or if you would like to pass on information regarding a prospective candidate. 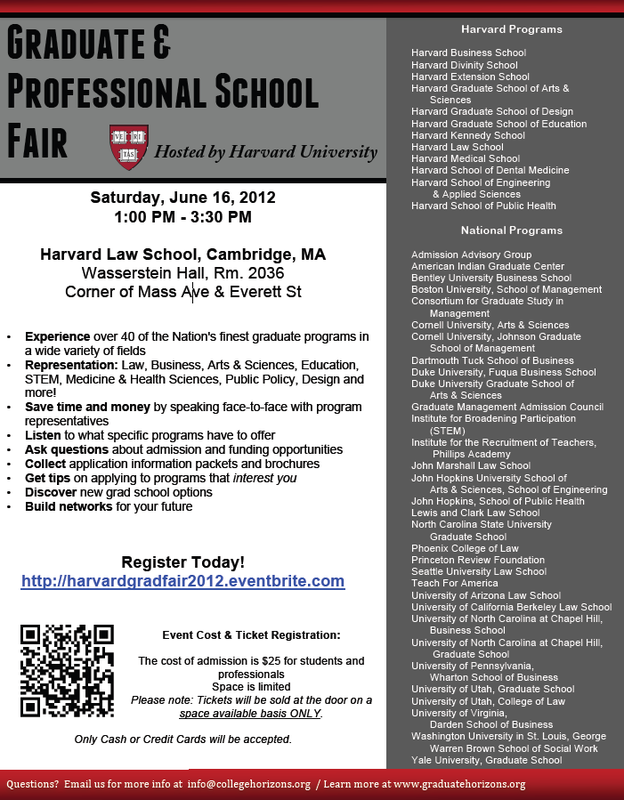 The 2012 Graduate Horizons program and Harvard University will host a Graduate & Professional School Fair that is open to the public on June 16th in Cambridge, MA.